The two-towered Church of St Cuthbert and St Mary belonged to Radford (Worksop) Priory, an Augustinian priory founded by William de Lovetot in 1120. 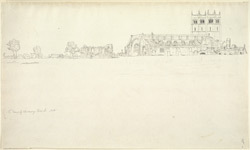 In its complete form the church measured 360ft in length (as seen in this view). Today the nave measures 135ft.